The d20 Modern campaign continues to entertain us all. For me, there has always been something challenging about "getting into" a RPG set in modern day. Frankly, the more similar a game world is to the real world, the more difficult my suspension of disbelief. Fantasy and SciFi worlds have always been easier for me to play. Nick has been doing a great job of building up his d20 Modern Arcana world without it becoming difficult to relate to. Sadly, we won't be meeting next Saturday, but on the positive side, there is a party to go to! I spent the day sanding the front and right hand side of the cabinet. I don't need to remove every speck of paint, but I need to get enough of the old material off so I can repaint it properly. This took a lot longer than I thought it would, and it looked like I dropped a toner cartridge when I was finished. Sweet! The second volume of Baccano! is now available from Amazon. I think they're doing a solid job with the English dub. More high quality footage for Baccano Swing! We had to skip a week due to St. Patrick's Day, but Saturday night Nick's d20 Modern game was back in full swing. Everyone is getting a chance to exercise their detective skills, there is more emphasis on research and planning than fighting a "monster of the week". 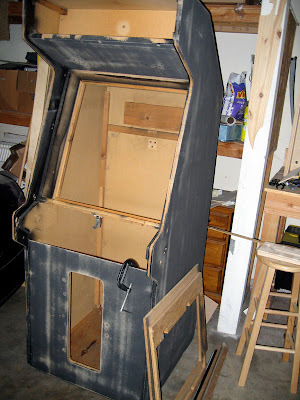 I brought this old empty arcade cabinet home today. 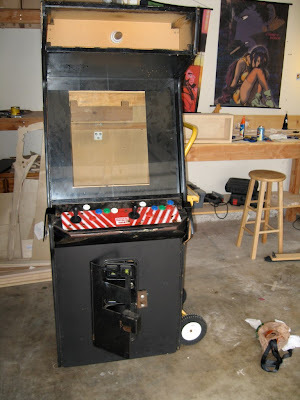 The plan is to fix it up, install an old PC inside and set it up to run Mame. This looks to be a serious project, its going to take a lot of work to get this thing looking presentable. The hilts for the swords are now complete. There is still a lot of work left to be done to prepare them for painting, but now all the pieces are in place. I like the way these props are shaping up, its just about time to cut the pieces for the scabbards. So I went in there back in January, intent on spending my little certificate of Free Money. I made my way along the posh hardwood floors and plush carpeted television displays to the back of the store where the cables are offered. This collection of cables, most from Monster, were the only things in the store for under $100. I had a box of unused A/V cables at home, so I wanted to get something I might actually use, but they were so overpriced, I couldn't bring myself to spend money... ... even if it wasn't real. However, this certificate had an expiration date, I was going to have to spend it before the end of March, or it would worthless. So I dragged myself back into Wilshire determined to exchange the certificate for some sort of merchandise. After some pondering I settled on the Monster Power Home Theatre PowerCenter, sensibly priced at $79.99. I finished the pieces I'll be using to build the hilt of the prop swords. The wood putty I'm using dries a bit to brittle to handle the shaping I want to do, so I'm going to need to find something else. I don't know if it is wood putty in general, or just the elmer's stuff I'm using in this instance. The fourth video in my series detailing the creation of the Hyperion Gunblade prop. This video focuses on sanding and shaping the small pieces that will be assembled into the gun-like handle of the sword. Brad Demoss and I sat down and started recording audio for a new project we hope to debut soon. I'll post more details once it has been formally released. I was impressed with the audio quality we were getting over iChat, especially now that I realize I had my Macbook pro on the wifi network. The first investigation came to a head in Nick's d20 Modern Arcana campaign. We uncovered the cause, but perhaps not the full reason for what had happened. 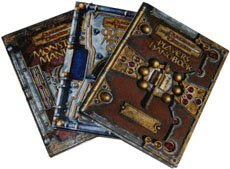 The d20 Modern system is different from standard D&D 3.5 in subtle ways. Its a little to bad we didn't start getting into this system until a few years after it went out of print. Focus shifted to the handles at this stage, the harsh edges needed to be sanded down to a gentle curve, even though the final version will be wrapped up. Maintaining the smooth edges around the bend at the end of the handle was a bit of a challenge. I'll be using wood putty to fill in the imperfections. These two swords are coming along nicely. There was a little bit of an issue with one of the blades, a middle section of plywood warped significantly after cutting. So I replaced that piece with another and finished up the shaping. Now work moves to shaping the handle and hilt.